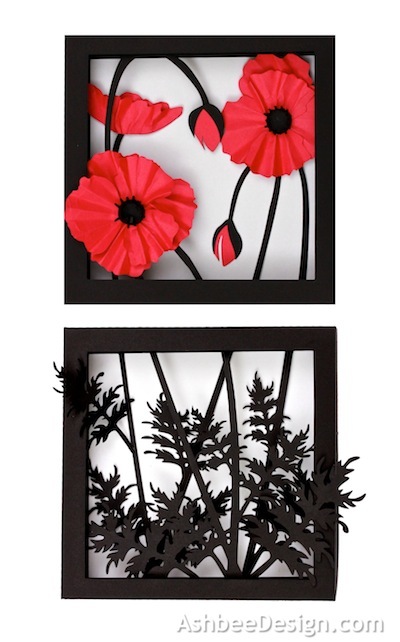 A reader asked if I could try to make a shadow box incorporating poppies. Poppies are such dramatic flowers that I knew they would be an excellent subject. 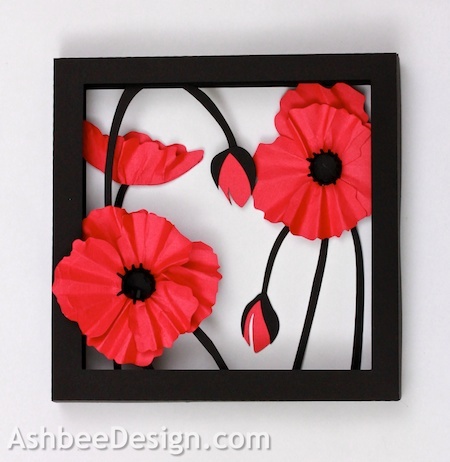 I spent some time looking at photos of poppies on Google images and then created this double shadow box design using card stock on my Silhouette cutting machine. Black and red always make a strong visual statement! The tutorial for assembling this shadow box is located here on my Silhouette tutorial site. The cutting file is available here at the Silhouette online store. I am getting quite a collection of shadow box designs now. Wonder what will catch my fancy next! The shadow box with the poppies in it is lovely. Take that Silhouette out of the box and start using it! Silhouette does have some online video tutorials and I had small problems right off the bat but only took a short time to work them ot - getting the feel for the cutting settings and the stickiness of the mat. wow, looking at those paper creations, makes me think I might want one of those fancy machines. The poppies and leaves look so professional. I certainly have enjoyed my Silhouette. It is worth giving up some desktop space to have. It won't last for ever, but when being a DIYer I change things up so regularly it doesn't matter. Paper is the correct material for some things! Wow! Your designs are amazing. What a talent you have. Thanks Tammy, It's ll this pinterest surfing plus getting a Silhouette that has reinvigorated my creative side. I loved it, i was wondering if you sell them. Omg, this is just amazing. Wooden Bike Chain- Almost 40 years later!